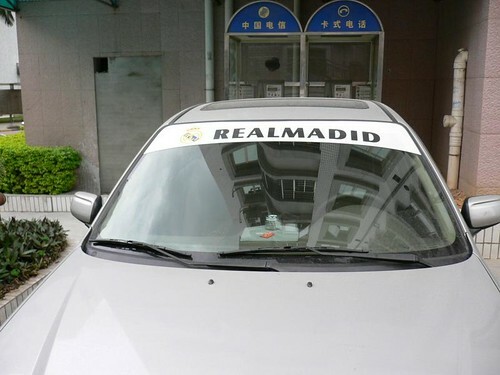 JayWalk - All Your Xmms Are Belong To Me: Car Of A Real Madrid Fan? Took this picture outside my place. At first glance, I thought the sticker quite interesting as I didn't expect to see a Real Madrid fan in this part of Ch1na. On second look, I realised that any true fan of the Galaticos would be foaming at the mouth if they see this. Gee, I wonder why? Click here or picture to enlarge. what does it mean really? Realm Adid? Real Mad Id? Read Ma Did? Well, it is supposed to be Real Madrid (Real = Royal, i.e. with the blessing of the Spanish monarchy and Madrid being the City of Madrid, of course). i think foaming at the mouth is quite an apt description from seeing real mad id. Imagine this fan were to go to Stadium Bernabeu and cheer his favourite team. Confirm sure kena hantam on the spot.